Getting a down signal from the ref at the 2014 USPA National Championships in Irvine, California. I pulled a 391 lb. 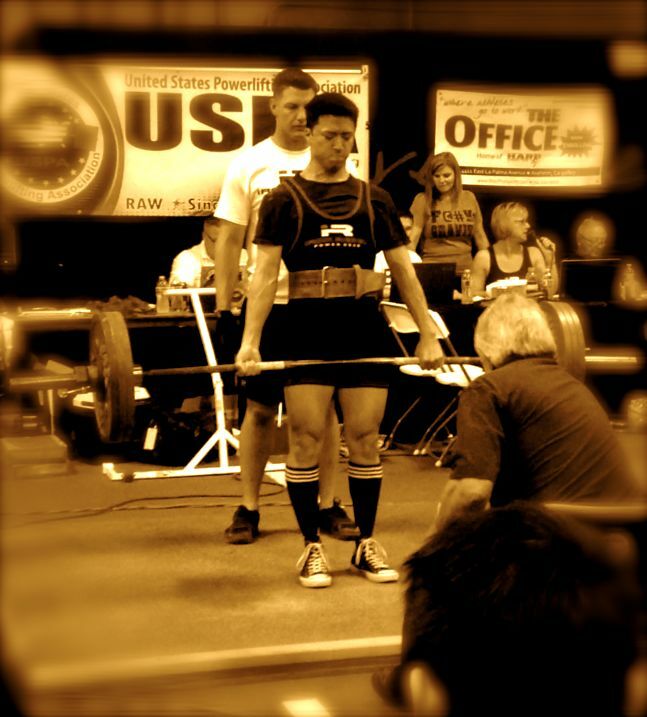 dead lift at 168 lb. body weight. Started the day with 2 cups of butter coffee. Many have delved into the world of body building, and have experienced shortcomings from pain, exhaustion, and mental fatigue. To the select few who realize this is not acceptable, I welcome you to join me in being strong, clear minded, and living a life of quality. My story began with a change in the way I looked at training and exercise. I played football and rugby through high school and college, and was ripped, athletic, and fast most of my life. I had done the workouts for team sports, the men’s magazine lifting programs, and was a dedicated gym rat with a three day a week work out schedule. I looked good and was happy with that for a while, but later this didn’t satisfy me. I was tired of feeling sore, feeling aches from previous sports injuries, and not really knowing if I was any stronger than a week or month prior. I also had a hard time keeping on muscle. If I didn’t go to the gym every other day, I would see pounds of weight drop and strength decline. I tried changing sets and reps and exercise programs to keep my body guessing, as this was supposed to encourage growth. This was a lot to maintain and I had a hard time doing so. I started looking for a training program that focused on real strength. This led me to powerlifting and a progression philosophy. I adopted a 5×5 training method from Stronglifts.com that focused on incremental strength gains, not drastic program switches. The five powerlifting exercises remained exactly the same, and only the weight increased with each and every training session. I started from the very beginning, lifting only the bar on some exercises. I not only felt better from the decreased stress on my body, but I also saw a steady increase in my strength. Lifting lighter weights gave me the luxury of refining my form in the squat, deadlift, and other exercises. I achieved a 370 lb. squat and 391 lb. dead lift after one year of training this way, at 168 lb. body weight. However, the training wasn’t the only factor to my increased potential. Food was the other part of it. In fact, without the changes in my diet that I had serendipitously come upon shortly after starting this training, I would not have progressed to this level so quickly if at all. Three months into my training, I met a buddy at the gym who just so happened to have started the same training philosophy as I had, at almost the same time. We talked about our common satisfaction with the progression training, and about putting ego aside to learn proper form at lower weights. At the end of that training session, he mentioned, almost in passing, something called BULLETPROOF® Coffee. It was coffee with grass fed butter and MCT oil blended together. This sounded strange to me, and I was instantly fascinated by the way he described the high level of focus he got from it. I went home and tried it, and never turned back. With the first few cups of the butter coffee that I tried, I was amazed by the mental clarity and brain energy that it gave me. Plus it was delicious. It changed the game for me at my job, as an overnight shift lead at a call center. I was sharper and more resilient to fatigue than my coworkers by multiple factors. I had always been an avid coffee drinker and used coffee as a key technology for enhancing my training sessions and overall performance as a human. Naturally, I wanted to know what it would be like to do strength training after drinking some of this power fluid. I started to drink the concoction before strength training sessions, and again I never turned back. The energy it gave me was different from that of traditional nutrition like carbs. Unlike carbs, the good fats provided me with a sustained high level of energy and mental focus. It lasted through the entire training session without any sort of energy crash. I was so focused that I could control myself better, like not drinking water between sets, breathing calmly under the bar, and paying absolute attention to form during my heaviest lifts. I was regularly in a flow state, and I tapped into the predator mode of mind and body that was only attainable with such nutrition as quality fat. This was my intro to the world of eating good fat. I slowly added grass fed butter and MCT oil into everything I ate. This pushed carbs to the back end of my days, as I did not need it for energy in the morning. Eating more fat and learning the potential negative effects of gluten significantly reduced the amount of bread and pasta that I ate. I started to experience better and more stable mood, and more consistent body fat levels. My joint pain from previous injuries faded. I no longer had to pace my kitchen ten minutes after waking to shake off the debilitating lower back pain. Being satiated with true nutrition freed me from cravings, mood swings, and exhaustion. Before I discovered good fats and progression training, I would work, work out, crash into exhausted sleep, and awake demon-possessed with rage, pain, and frustration. These states of misery used to be normal life for me. The people I loved hated waking me up. I believe what is stated by the research that connects wheat to inflammation, and thus joint pain and brain impairment. When I started to avoid wheat, I noticed these incredible improvements in my body and my mind. This transformed the way I looked at eating and I started to learn what foods I really did and didn’t need. I tested my diet changes against my strength training, and was surprised that even without tons of bread, expensive and gas-producing protein shakes, and pounds of chicken breast every week, I was getting stronger and clearer than ever. With changes like these I felt the best and strongest I have ever felt in my life, and I plan on being even more so. You want just as much as I do to be clear minded and strong. You want to be the best person you can be, making the sharpest decisions and acting in accordance with your values. Intelligent and resilient people like you and me can daily engage our potential to become the brilliant beasts that we are. I welcome you to join me on this path to discovering what it means to be more fully human. I am not perfect, but I am better.